The Model 642 soft x-ray source is a compact, convenient to operate source. The unique dual-output of equivalent beams make it a useful for many comparative applications in addition to wavelength calibration and so on. The two output beams originate from two views of the single emitting spot where the electron beam collides with the interchangeable anode. 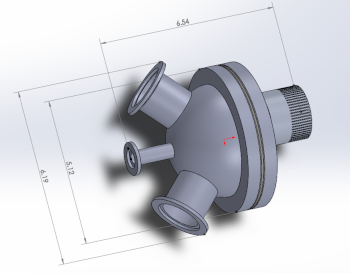 The emitting spot is about 1 x 4 mm and depends on the source’s operating conditions. The Model 642 is available as a single anode source. The anodes may easily be exchanged at atmosphere. The larger Model 642-1 is even more flexible. It has a multiple-anode carousel allowing the user to exchange anode materials without breaking vacuum. Both sources are good candidates for soft x-ray measurement and calibration applications. The soft x-ray sources are provided with a filament current controller and 10kV high voltage supply for operation up to 30 Watts. Option exists to water cool the anodes and operate with power high as 300 Watts. Please inquire. Abstract: The Static X-Ray Imager (SXI) is a National Ignition Facility (NIF) diagnostic that uses a CCDcamera to record time integrated X-ray images of target features such as the laser entrance hole of hohlraums. SXI has two dedicated positioners on the NIF target chamber for viewing the target from above and below, and the X-ray energies of interest are 870 eV for the “soft” channel and 3 – 5 keV for the “hard” channels. The original cameras utilize a large format backilluminated 2048 x 2048 CCD sensor with 24 micron pixels. We describe the characteristics of the new cameras and present performance data (quantum efficiency, flat field, and dynamic range) for the front- and back-illuminated cameras. Abstract: The Atomic Energy Commission has set up a laboratory dedicated to the calibration of x-ray cameras mainly used in the Laser MégaJoule Facility in the Bordeaux region of France. 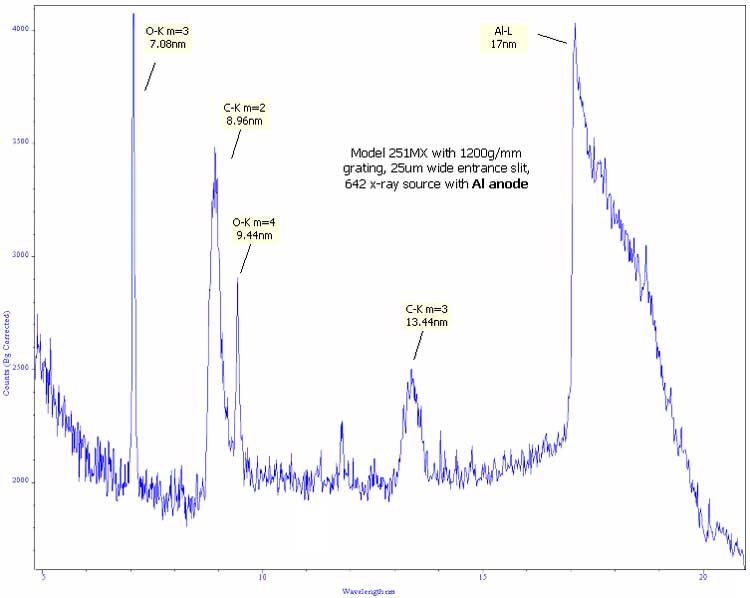 Thanks to a double crystal monochromator specifically designed to perform such calibration, we calibrated a thinned, back-illuminated x-ray CCD manufactured by Roper Scientific Inc. over the 2.2–8.9 keV spectral region. Quantum efficiency results are in good agreement with those of previous works. To explain slight differences, we studied the difference between monochromatization methods performed either using a crystal monochromator or filters. Results showed that the latter method appears to be too dependent on the x-ray source parameters to perform accurate and relevant calibration on x-ray cameras. Abstract: P-channel charge-coupled devices (CCDs) made from N-type silicon wafers were originally developed for ground-based optical and near-infrared telescopes. The thick depletion layer of these CCDs provides the significant advantage of high quantum efficiency (QE) for hard X-rays. On the other hand, high QE for soft X-rays is obtained with back-illuminated (BI) and fully depleted CCDs in which only a thin dead layer exists on the surface of incidence. Thus, P-channel BI CCDs can be applicable as superior wide band X-ray detectors. We have developed such a device specifically for the Soft X-ray Imager (SXI) on board the X-ray astronomy satellite ASTRO-H, scheduled to be launched in 2014. We previously reported that the depletion layers of our CCDs, a prototype of SXI-CCDs, have a thickness of more than View the MathML source. In this paper, we report a novel soft X-ray response of P-channel BI CCDs. First, we irradiate fluorescent X-rays of O, F, Na, Al, Si and K to the SXI prototype. This experiment reveals that our CCD has a significant low-energy tail structure in the soft X-ray response. Since the intensity of the low-energy tail is larger for lower X-ray energies, the tail is originated on the CCD surface layer. Then, we fabricate a new type of CCDs by applying an alternative treatment to its surface layer. The soft X-ray response of the CCD is measured by irradiation of monochromatic X-rays from 0.25 keV to 1.8 keV in a synchrotron facility, KEK-PF. The intensity of the low-energy tail for 0.5 keV incident X-ray is one order of magnitude smaller than that for the previous CCD. The same treatment will be applied to the surface layer of the SXI flight model. Abstract: High quality absorption spectroscopy measurements were recently achieved at the Sandia National Laboratories Z facility in the soft x-ray range. Detailed spectral resolution knowledge is a key requirement for their interpretation. We present a methodology for measuring the wavelength dependent crystal spectral resolution, with a particular focus on the 7–17 Å range. We apply this procedure to the case of 1st order resolution of a potassium acid phthalate (KAP) convex crystal spectrometer. One calibration issue is that inferring the crystal resolution requires that the x-raysource emission feature widths and spectral profiles are known. 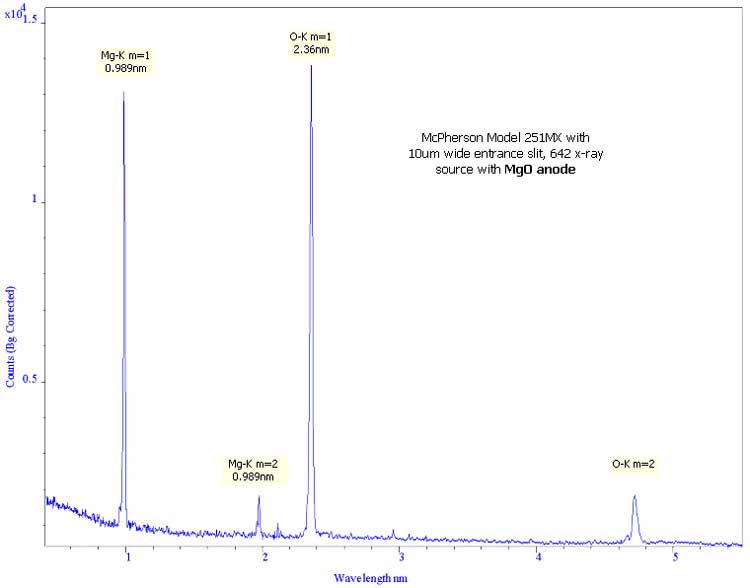 To this aim, we resolve Manson x-raysource Si, Al, and Mg Kα line profiles using a KAP crystal spectrometer in 2nd order to achieve relatively high resolution. This information is exploited to measure 1st order KAP resolving powers λ/Δλ∼1100–1300 in the 7–10 Å wavelength range. Abstract: National Security Technologies (NSTec) has developed calibration procedures for X-ray imaging systems. The X-ray sources that are used for calibration are both diode type and diode/fluorescer combinations. Calibrating the X-ray detectors is key to accurate calibration of the X-ray sources. Both energy dispersive detectors and photodiodes measuring total flux were used. We have developed calibration techniques for the detectors using radioactive sources that are traceable to the National Institute of Standards and Technology (NIST). The German synchrotron at Physikalische Technische Bundestalt (PTB) is used to calibrate silicon photodiodes over the energy range from 50 eV to 60 keV. The measurements on X-ray cameras made using the NSTec X-ray sources have included quantum efficiency averaged over all pixels, camera counts per photon per pixel, and response variation across the sensor. The instrumentation required to accomplish the calibrations is described. X-ray energies ranged from 720 eV to 22.7 keV. The X-ray sources produce narrow energy bands, allowing us to determine the properties as a function of X-ray energy. The calibrations were done for several types of imaging devices. There were back illuminated and front illuminated CCD (charge coupled device) sensors, and a CID (charge injection device) type camera. The CCD and CID camera types differ significantly in some of their properties that affect the accuracy of X-ray intensity measurements. All cameras discussed here are silicon based. The measurements of quantum efficiency variation with X-ray energy are compared to models for the sensor structure. Cameras that are not back-thinned are compared to those that are. Abstract: The Static X-ray Imager (SXI) is a diagnostic used at the National Ignition Facility (NIF) to measure the position of the X-rays produced by lasers hitting a gold foil target. The intensity distribution taken by the SXI camera during a NIF shot is used to determine how accurately NIF can aim laser beams. This is critical to proper NIF operation. Imagers are located at the top and the bottom of the NIF target chamber. The CCD chip is an X-ray sensitive silicon sensor, with a large format array (2k x 2k), 24 μm square pixels, and 15 μm thick. A multi-anode Manson X-ray source, operating up to 10kV and 10W, was used to characterize and calibrate the imagers. The output beam is heavily filtered to narrow the spectral beam width, giving a typical resolution E/ΔE≈10. The X-ray beam intensity was measured using an absolute photodiode that has accuracy better than 1% up to the Si K edge and better than 5% at higher energies. The X-ray beam provides full CCD illumination and is flat, within ±1% maximum to minimum. The spectral efficiency was measured at 10 energy bands ranging from 930 eV to 8470 eV. We observed an energy dependent pixel sensitivity variation that showed continuous change over a large portion of the CCD. The maximum sensitivity variation occurred at 8470 eV. The geometric pattern did not change at lower energies, but the maximum contrast decreased and was not observable below 4 keV. We were also able to observe debris, damage, and surface defects on the CCD chip. The Manson source is a powerful tool for characterizing the imaging errors of an X-ray CCD imager. These errors are quite different from those found in a visible CCD imager.